This weekend I was out searching for migrants and was actually relatively successful! 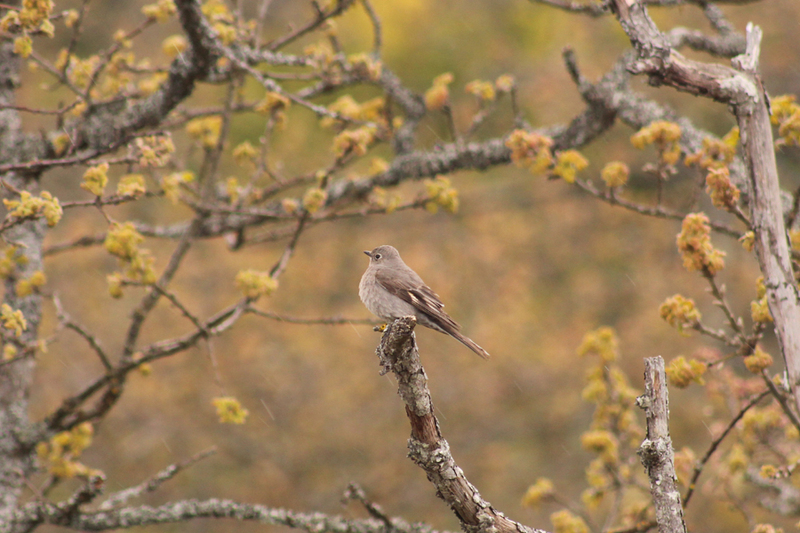 In my last post, I was griping about the lack of results I was getting while scanning the fields and hilltops for Mountain Bluebirds, Townsend's Solitaires, and Say's Phoebes. I was eagerly awaiting the arrival of shorebirds on the flooded fields and couldn't wait for the next wave of spring arrivals. That time has arrived! I must admit, after writing that post I went out the next day and had a bird I was quite pleased to encounter. I spent a few hours out with Jeremy K. and we started at Summit Park. Before he arrived, I booked around the northern half of the park and lucked out with my first Chipping Sparrow of the year. When Jeremy K. arrived, we were walking around the reservoir and I picked up on a familiar song. It's wasn't familiar from a Victoria standpoint, but rather from the work I do in northern Alberta. 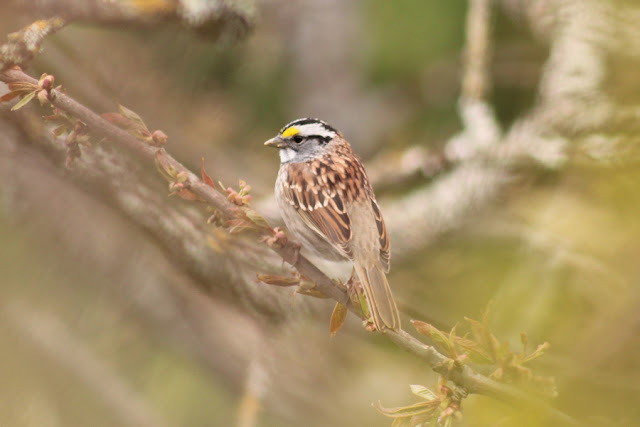 It was the song of a White-throated Sparrow and we managed to quickly locate the bird. It was an immaculate specimen and I had to work a bit to get a shot of it, but it was worth the effort. I think that sighting was how I got my groove back. In your face, Stella! White-throated Sparrows don't get much sweeter than this one! It was great to hear it belt out its signature "Oh-sweet-Canada-Canada" song. Alright, now let's get back to this weekend where my groove was in full effect. Apparently my direction-reading skills were pretty diminished as I did my volunteer Sky Lark census a day early, but my bird-finding skills were going strong. While circling the Victoria International Airport on Saturday morning, I had two female American Kestrels, an adult Sharp-shinned Hawk, and - the big highlight - a Whimbrel. The Whimbrel was calling as it flew over and then it doubled back and landed in a recently plowed field along Willingdon Rd. I was really hoping for a Long-billed Curlew, but a Whimbrel is certainly a good find! After the survey was over, I made a stop in at Saanichton Spit and kept the trend of interesting birds rolling when I spotted a bulky swallow-like bird overhead. A quick look through the bins confirmed this all-dark bird was the first reported Purple Martin of the spring in British Columbia. The only other birds of note there were a lone breeding-plumaged Dunlin, two Greater Yellowlegs, a couple of peeps (presumably Leasts) that I only saw flying, and an American Pipit calling as it flew over. I decided to drive home by cutting across Central Saanich Rd. and this turned out to be a very good plan! While passing the rather tantalizing agricultural fields on the west side of the road, I pulled over on a whim, hopped and jumped the ditch, and then scanned the field from the fence. One skinny, plastic pole out in the middle of the fields appeared to have a bird-like shape on top of it and that object appeared to be blue. I quickly jumped back over the ditch, grabbed my scope, hopped back over the ditch, checked if the shape was still there, dropped the tripod legs, and finally had the scope focused on the spot. At that moment I knew what the bluebird of happiness was all about - I was thrilled to see a male Mountain Bluebird after putting in the hours over the last two weeks! I watched it for a bit and then got distracted by a flock of American Pipits. When I went to look at the bluebird again, that sky blue scoundrel had given me the slip. It was nice while it lasted. I thought I'd hit up the flooded fields and flats around my place in the early afternoon in hopes of more good shorebirds. I started at Maber Flats where the only shorebirds were two Killdeer and a couple of Greater Yellowlegs. I moved on to Oldfield Rd. and bumped in to Ed Pellizzon and we played catch up while enjoying an incredible raptor display. The first raptor was a Cooper's Hawk that I spotted sitting on the ground while walking to meet Ed. The hawk spotted me and took off with something in its talons. I just managed to discern that it had taken a European Starling - keep up the good work! Next, we watched a single immature Bald Eagle circling with a kettle of ravens (I counted approximately 40 at one point). Shortly after, two Red-tailed Hawks crossed over the flats and we were surprised at how pale one of them appeared. I am not sure if it's a light-morph Harlan's Red-tailed or a light-morph of our usual Western Red-taileds, but it certainly stood out. We also tallied a Sharp-shinned passing over and then a Peregrine Falcon made an impressive pass over the flooded fields. Just before Ed and I parted, we were treated to a return pass from the Sharp-shinned Hawk and this time it was carrying what appeared to be a vole in its talons. Moving ahead to Sunday, I tried birding out a Ten Mile Point which was not all too exciting. The best sighting was a pair of Marbled Murrelets - one in breeding plumage and the other still wearing its winter duds. I also enjoyed a group of cooperative Pine Siskins and managed to snap a close-up shot when one delicately perched on a dead grass stems only a couple metres away. 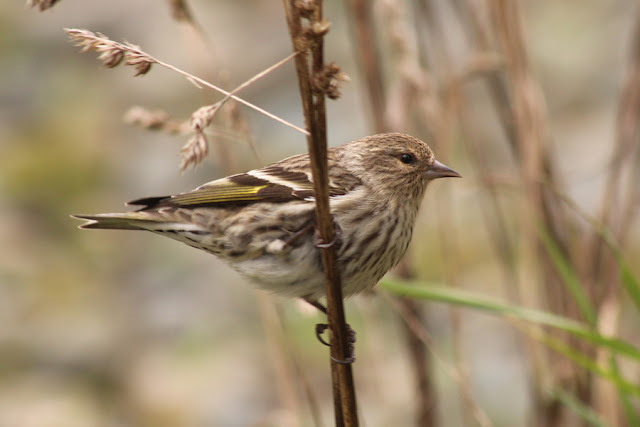 Pine Siskins are currently here in full force and it's hard to go anywhere without encountering several flocks. After Ten Mile Point, I then flip-flopped on where to go and ended up putting in half an hour at Mount Tolmie. I parked in the lot just below the summit and walked out to a viewpoint that looks over the north slope. I braved the heavy drizzle and scanned the oaks with my bare eyes just hoping for movement. On cue, a bird crossed the gap and I managed to get my bins on it just in time to see the bird was sporting nice buffy wing bars. I've filed that field mark in my head as Townsend's Solitaire and when the bird landed, I was able to confirm that's exactly what it was. I carefully made my way down the slope and managed to get great views and some photos of the solitaire. What a treat! This seems to be how I see most of my Townsend's Solitaires locally - they love open, rocky Garry Oak hillsides! Next weekend I will be heading off to Fort McMurray for work, so hopefully I will have time to take a day off this week that I can dedicate to birding. I want to hit up Jordan River or even further west in hopes of turning up some interesting migrants. If it doesn't happen, the next update might come from far afield. Jeremey. I noticed in your post that you did a skylark census around the airport. I'll be in the Victoria area in August and was wondering if they hang out in some particular areas or just in general around the airport? I used to recommend going to the Vantreight bulb fields, but I now recommend doing a circuit around the airport and stopping in at various points to scan for the Sky Larks. I made up a Google Map some time ago and have considered making a post dedicated to the Sky Larks as this is the most common request I receive from out-of-town birders. Here are two maps for you - one focuses on the airport and the other puts pins on the three main areas the Sky Larks are found on southern Vancouver Island, all of which are on the Saanich Peninsula.